Organic Fertilizers for a Greener World! 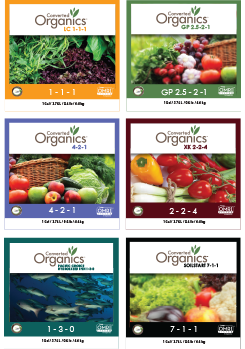 Converted Organics™ produces valuable all-natural fertilizers, biostimulants, and soil amendment products that help grow healthier crops and improve environmental quality by recycling food wastes. Transition to all natural organic lawn fertilizer from synthetic chemical fertilizers. 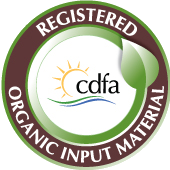 When applying Converted Organics fertilizer for the first time it is recommended that you apply at a rate double the regular application rate. This double application is recommended in order to jump start the soil enrichment process. If you have been using synthetic chemical fertilizers you probably have a sodium / salt residue left behind in the soil that inhibits microbial activity. A one time double application of Converted Organic fertilizer will increase microbial activity, supply additional organic matter to the soil, restore nutrients and enrich the soil to an effective level to begin the transition. Converted Organics fertilizer is a slow release 100% all natural formulation that is broken down by microbial activity and to a lesser extent by moisture. This process will take on average from 7 to 10 days and will continue to supply nutrients to the soil for up to 8 to10 weeks. This differs from most synthetic fertilizers which are quick release, water soluble and will start working in about 3 days and are only effective for about 3 or 4 weeks. The organic fertilizer is safe to use with regards to children, pets and the environment, there are no warnings on the package and it is safe and easy to apply with no protective clothing or breathing protection required and no concern about over application. Organic fertilizer because it is slow release and highly insoluble won’t leach into ground water or run off into surface water. Green up takes a little longer to appear however will last twice as long and every time you apply Converted Organics fertilizer you are continually enriching the soil and contributing additional organic matter. What about dollar spots, brown patch and other lawn diseases? Converted Organics fertilizer has disease suppression characteristics that will fight off these bacterial diseases by acting similar to a fungicide. This disease suppression and the fact that you are enriching the soil with each application will result in less need for the use of synthetic chemical fungicides. Weeds should be controlled the old fashioned way; by hand pulling or if needed by using a spot shot application of chemical weed killer. Do not use a weed killer over entire lawn unless it is absolutely necessary. If you use Converted Organics fertilizer over a period of two or three seasons you will have healthy soil and you will have healthy grass plant with strong root structure. Healthy grass is a stronger plant than most weeds and will crowd them out thus inhibiting the growth of weeds. What about grubs and bugs? Every application of Converted Organics fertilizer adds organic matter to the soil. Healthy soil will have a great deal of microbial activity and this microbial community is the natural combatant to lawn pest infestation. If you are transitioning from years of synthetic chemical use you may need to use a chemical spot pest control product if pests appear. Use these products carefully and read the warnings on the label before use. Download this Transaction article in PDF. When starting any new lawn care regiment it is suggested that you have your soil tested. A test will tell you if there is a deficiency in the soil and then you can take steps to make the necessary adjustments. Apply at double the normal application rate. Apply at 10 lbs. per 1000 sq. ft.
All subsequent applications should be at 8 to 10 week intervals at the regular rate of 10 lbs. per 2000 sq. ft. Converted Organics fertilizer application prior to winter in northern climates is recommended for strengthening root systems and preparing your lawn for the next growing season.